"Everybody's Got It Easy But Me is at once the Intelligence's most lyrically direct and musically exploratory album to date, introducing pastoral psychodelia, space-age bachelor-pad vibes, and at least one proper ballad to the mix." ^ w/ Man or Astroman? 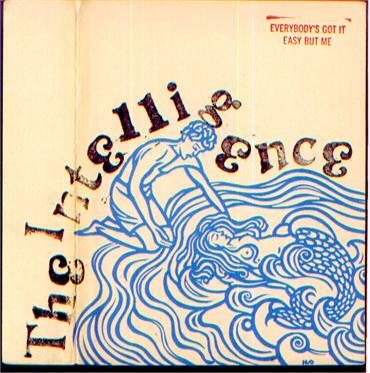 The Intelligence have been a band / musical project since 1999. To date The Intelligence have released seven singles, five split singles, two EPs, seven albums and have made eight compilation appearances. I’ve probably even missed a couple. They join the ranks of artists like Thee Oh Sees and Ty Segall in the department of those whose output could be considered hyper-prolific or impossible to keep up with. That said, like the afore mentioned artists, with each release The Intelligence continue to evolve, grow artistically and top themselves. And, YES, you do need to keep up with all the releases. On “Everybody’s Got It Easy But Me' The Intelligence do indeed top themselves. Like their last album, “Males” from 2010, they have returned to The Hangar with Chris Woodhouse to record. As with “Males” they seem to continue to jettison their previous deliberate blown-out, lo-fi recording approach for a much clearer sound. Not that there’s any give-up in intensity. The band’s scrambling post-punk guitars, its straight-up, dry-as-a-bone drums, its laconically abstract verses are all here, just viewed through an unusually clear lens. If you didn’t have the songs or the chops this sort of thing could reveal some weaknesses but, in this instance, it showcases Lars Finberg’s knack for writing catchy songs, which incorporate pop hooks, metronomically repetitive guitar riffs and new wavey synth moves. For those who haven’t been paying attention, "The Intelligence" are the brainchild of Lars Finberg (former of the A-Frames, currently of Thee Oh Sees and Wounded Lion). The Intelligence began as a studio project in which Finberg played all instruments on his home recordings. As the band began to play live and tour the releases have volleyed between full band recordings and Lars layering all tracks himself. On “Everybody’s Got It Easy But Me” Finberg has gone for a mixed approach. Having recently relocated to Los Angeles, Lars assembled an LA line up of the band. Still spending much time at the band’s original home base of Seattle, he has retained a separate line up in that city as well. For this new album he has used them both….as well as doing some songs all by himself. He also invited a number of guests to come in and add to it. The result is the most varied yet cohesive Intelligence album to date.